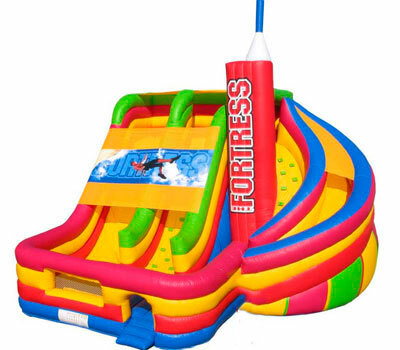 The Fortress Slide is our biggest and most impressive inflatable. The Fortress Slide has two slides; it combines a straight and a circular slide, complete with straight and circular stairs. Catering to both the adventurous, and those that are just a little less adventurous. At 8.3 metres high the Fortress Slide is guaranteed to challenge both young and old alike, bringing smiles to all as they go down one of the two slides time and time again. Restriction: Suitable for ages 4 upwards.